Back to school, back to church. Throughout the country, churches of all sizes and denominations often experience a bump in fall church attendance. Congregations inexorably benefit from people wanting to get back into the rhythm of “normal” life after the erratic pace of summertime. Much of the fall church attendance increase is regulars being regular again, to be sure. However, this isn’t universally the case. 3) Are there any new faces checking out our church for the very first time this fall? If you answered “yes” to any or all of those three questions, then you must not waste the fall church attendance bump. The period of growth generally starts in August and ends in early November. Your church has just a couple of months to leverage this fall church attendance boost. Time is of the essence. Have a friend that attends elsewhere or fellow pastor visit your church–ideally on a Sunday, but even on a weekday can be beneficial. Ask them to be brutally honest. What’s the first impression of the parking lot? What does the church smell like when you walk in the door (trust me, you’ve gone nose blind to it)? What major blemishes exist in the building, like carpet stains or warped ceiling tiles? Ideally, you should bring in an expert to do a First Impression Evaluation for you. However, any outside input you can get would give you some clarity on how to spend just a few dollars to make a significantly better impression. Very often the improvements are incredibly inexpensive. You can’t just think there are new faces at your church. You have to know. Not only that, but you have to know who they are. Think through the culture of your church and your philosophy of ministry, but be intentional about identifying and caring for first-time guests. Charge your greeters with the task of trying to find them. Ask ushers to be on the lookout. Invite first-time guests to an after-service meet-and-greet. Whatever it takes, be sure you see, recognize, and identify new guests. Once you’ve identified first-time guests, the most critical step in maximizing new faces during the fall church attendance bump is to follow-up. You can read this article for step-by-step instructions on how to follow-up with guests. If you follow these tips, you will increase your guest retention. Most churches either have no formal follow-up process at all, or they follow it inconsistently. Have a guest follow-up system, and stick to it relentlessly. Inconsistency is the enemy of success. If your church lacks a leadership pipeline, you will not be able to fully maximize the fall church attendance bump. People will fall through the cracks. Volunteers will burn out. There will be no structure for identifying, assessing, training, and launching leaders. Stratify your church leadership structure to allow for more oversight, mentorship, and recruiting at every level of ministry. If that sounds like a foreign language, you should consider getting help with leadership pipeline design. If you experienced a 20% increase during the fall church attendance bump, would you have enough space in small groups or classes if two-thirds of the newcomers wanted to join? Do you have enough small group leaders and hosts? Do you have enough trained teachers for classes? Do you have a strategy for connecting newcomers into community life efforts? The best time to train new leaders for community life was last spring. The second-best time is right now. Don’t wait; if people feel like there is no room for them in small groups in this season, they’ll likely skip it at least until the spring (and maybe the entire ministry year). Many people are afraid to go from going to church on a Sunday morning to attending a small group in a stranger’s home. We often guilt people into joining groups without recognizing and affirming the social awkwardness of walking into someone’s home and having to interact at the soul-level. Because of this, your church should be strategic about the kind of social or “fellowship” events you have. Use these events to funnel newcomers into less-formal, less-awkward relationships with group leaders. It will make it so much easier to transition into a home group. How lonely is your church’s Facebook page? Be honest. Do you post the same one or two posts a week? Do you interact with anyone? Have you even posted all summer? Click here for a simple guide on how your church can leverage Facebook. Now is also the time to be honest about your website. Is the information up-to-date? Does it need a facelift? Most newcomers start looking for a church online. So be sure your digital front door is ready for the fall church attendance bump. People are looking for a reason to doubt your church’s authenticity. We live in a skeptical society, expecting the church to be hypocrites. If you want to show newcomers that you truly value the things you talk about on Sunday mornings, be sure you show it. One great way is to do something for the community that you won’t necessarily get credit or recognition for. Many times, churches will do a community outreach event to gain notoriety or publicity. Do not do this. 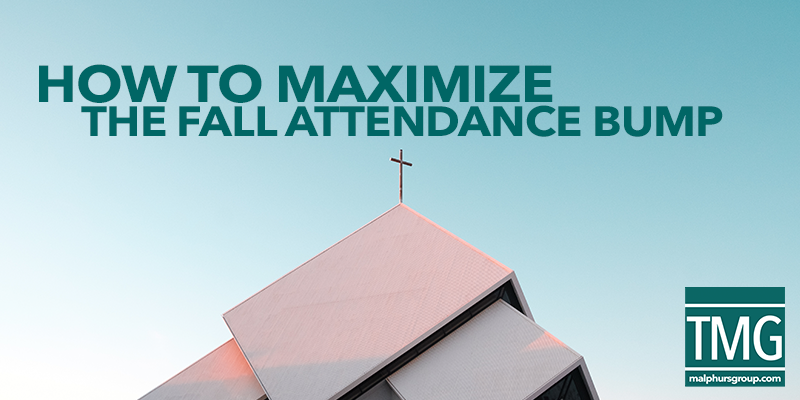 Be intentional about leveraging your fall church attendance boost to engage your congregation in an outreach effort that has no ostensible benefit for the church. Where is your church going? What impact are you trying to make? What’s the exciting future that your church is walking towards? Why would someone want to invest their time and money into the ministry of your church? Newcomers may or may not ask these questions out loud. But they should hear the answers to them during the fall church attendance boost. Give people a reason to want to be involved in your church. Paint the picture for the future. If you’re not sure what a good church vision looks like, you can read this, this, or this. Whatever you say you’re going to do, do it. And do it with excellence. Each staff person should follow through on their commitments. Pay attention to the small details. Don’t cancel meetings unless there is a true emergency. Return phone calls. Answer emails. If you commit to communicate weekly via email with the church, don’t miss a week. Be consistent. Your commitment to follow through on your promises will speak volumes to newcomers, fringe attenders, and regular attenders. Everyone will appreciate it, and it will go a long way in retaining many of those who come during the fall church attendance bump.